Following an illustrious career spanning decades in Hollywood as a respected and published fine art / portrait photographer as well as art boutique partner in LA’s designer district Doug set his talented eye on the beach- Mandalay Shores to be exact! With the beauty of our surroundings as inspiration Doug handcrafts each and every one of his unique creations with exceptional attention to detail. Using beautiful hand selected shells as the main medium and introducing other natural elements like sea glass, driftwood, gems ,beads etc. the results range from naturally weather worn organic to beach chic glamour! 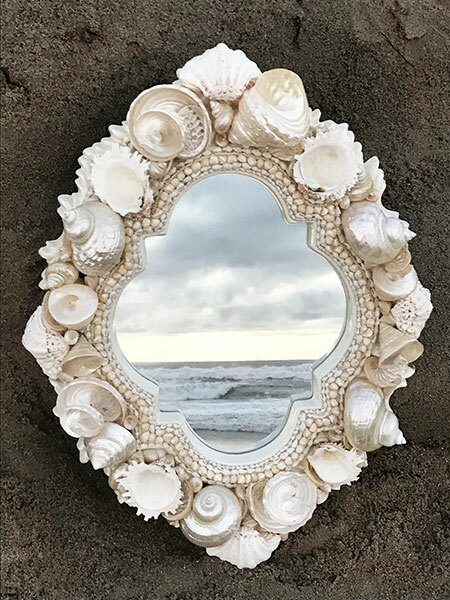 Ranging from large statement mirrors to small bejeweled starfish to trinket boxes and luxurious home decor items each one of a kind piece is sure to be a conversation starter. Several examples of Doug’s work already adorn homes right here in the Shores as well as homes in Los Angeles, Miami and many others across the country. His design philosophy that we should all be surrounded by beautiful things that make us feel good is clearly reflected in his work. Along with his dog, Larry, Doug loves living in our eclectic community here at the Shores!